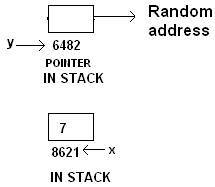 This problem occurs when the address of the local variable is returned from a function or the programmer deletes the allocated memory mistakedly. But when the function abc() returns, the address of the variable x is stored in y and INTENTION is to use x as pointee of y. But with the return of the function abc(), the stack frees the variable x. 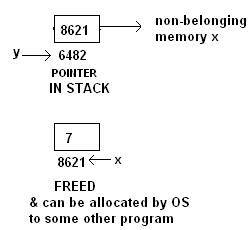 Hence memory location of x can be used somewhere else by the Operating System. The non-belonging memory is the memory which doesn’t belong to the program anymore. Hence the situation now is similar to the DANGLING POINTER case. Hence the 2nd statement of main() may cause ERROR.